A week after rattling global bourses and annoying allies with a unilateral ban on some forms of financial market speculation, Germany went much further Tuesday, proposing a law that would greatly broaden restrictions on several instruments that investors use to bet against stocks, bonds and currencies. There is broad support for such measures among leaders on both sides of the Atlantic, and some of the proposed rules are already in effect in the United States. Other European nations, however, have complained about Germany’s decision to act alone. “What the Germans are doing would be all the more effective if it were done at a coordinated European level,” Chantal Hughes, a spokeswoman for Michel Barnier, the European Union internal markets commissioner, said Tuesday. The draft law, released Tuesday by the German Finance Ministry, expands a ban on so-called naked short-selling to all stocks that have their primary listing in Germany, as well as on government bonds issued by euro countries. The law, which will take at least until September to win passage in Parliament, would also ban naked short-selling of the euro, and enshrine a ban on use of so-called credit default swaps to bet against European government bonds. This will teach the naughty markets to behave. fiction. The truth being that they are Insolvent; the fiction being that they are NOT. POLITICALLY correct and PRACTICALLY incorrect ratings. 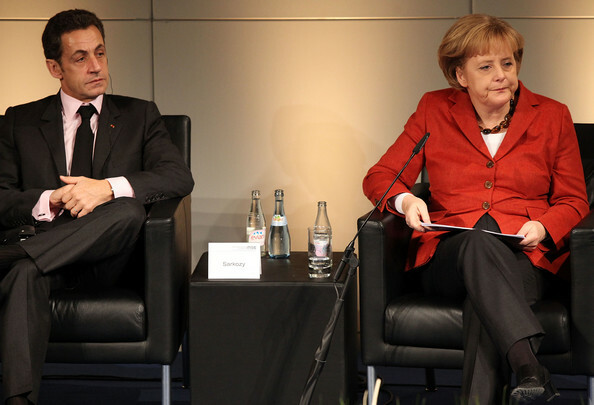 nice to see Sarkozy there drinking evian - "naive" backwards. I can buy insurance on my house burning down. I have no incentive to set it ablaze because I only get back in cash what I have lost to the fire. Now if I could buy insurance on your house burning down, I pick up the cheque without any loss. I have every incentive to ensure you house does burn. This is the situation with CDS's. When I can buy bond insurance on bonds I do not own defaulting, I am going to do all I can to bring that about.